As railroads are all old and presumably haunted, ghost trains have made a lasting impression on Halloween lore. And since phantom trains clank across the rails from Stockholm to St. Louis, it's probably time you consider buying a ticket for a frightful ride to remember -- besides your usual subway commute. 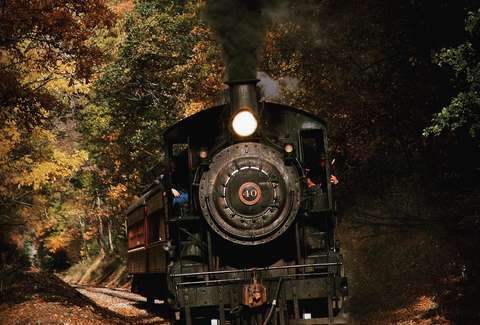 That's where the New Hope and Ivyland Railroad comes in: The Pennsylvania rail company is hosting a haunted train ride during the month of October that'll purportedly shuttle you straight into the spooky abyss. OK, maybe not literally, although you'll be brushing shoulders with a gang of surly "creatures" while riding the train, all of whom will be "sure to frighten the strongest of heart, and test the nerve of all onboard," according to the company's website. The train departs under the cover of darkness from New Hope, Pennsylvania, and snakes its way through an eerie stretch of railroad that apparently drifts into "the hands of the unknown." It's recommended that only adults venture out to the ghost train, but steel-nerved teenagers are welcome to scrap with the ghouls as well. Take a ride on the dark side aboard the Haunted Halloween Train - Terror on the Tracks at @new_hope_ivyland_railroad. As soon as this horrifying train leaves the station, you'll be tossed into the hands of the unknown when ghouls, ghosts and goblins emerge around every turn. The $35 ride lasts 40 minutes, which is probably more than you'll be able to handle anyway. The cars are decked out in an early 20th century vintage, so don't expect any free WiFi or Starbucks as you dodge the hooded spirits. But hey, alcoholic beverages are sold onboard, because you'll likely need a little liquid courage to deal with the commotion. As ghost trains only adhere to the schedules of the supernatural, you can expect to catch a ride on weekends starting October 13 through Halloween, with the occasional Thursday evening journey. Some coach reservations have already sold out, so do book your tickets soon if you plan on riding this haunted train. And make sure to arrive 20 minutes prior to departure, as ghosts wait for no man, woman or child over the age of 13. As willfully subjecting yourself to horror is not a natural course of action for everyone, you can always look forward to taking trains that aren't haunted. But then again, there's no reason why a normal train can't become overrun with ghosts eventually. Just ask the undead.